If you’re looking to improve the look of your property, eliminate unsightly dead or overhanging trees, or need tree and shrub maintenance in Southeast, MI, we are the professionals to call. 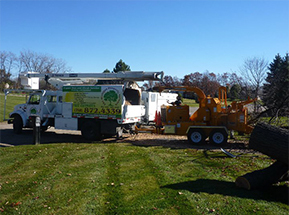 At The Michigan Property Network, LLC, we are committed to providing all of our customers with prompt, reliable and professional tree services. Proper care is necessary to keep your trees and shrubs looking their best; that’s why we only employ experienced qualified tree professionals. Tree service is a very dangerous industry, reporting thousands of injuries per year. As a property owner, it is important to only hire a tree service company that is adequately insured with worker’s compensation and general liability insurance. To keep our customers and employees protected, we carry over 2 million dollars in insurance coverage. Our team of professionals is continuously being educated on proper safety techniques, including chainsaw safety, proper cable and bracing, aerial rescue situations, electrical hazards and CPR. The Michigan Property Network is a member of TCIA (Tree Care Industry Association), the largest association for tree care professionals. Being a member of TCIA allows our staff to be fully informed on the most up-to-date industry standards and ongoing training and education that is a must for any tree care professional. Our team is not only highly qualified, professional and experienced, but they are the best in the area! Our testimonials and customer reviews are all the evidence you need. Check out our testimonials page to see what our customers are saying about us, and feel free to contact us for additional references. Estimates and consultations are always no cost to you, so call us today to find out how The Michigan Property Network, LLC can assist you with your tree care and land clearing needs.